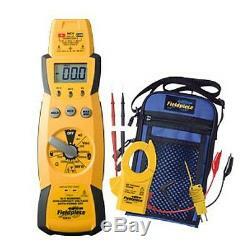 Fieldpiece HS33 Expandable Manual Ranging Stick Multimeter HVAC/R Full Featured. Expandable Manual Ranging Stick Multimeter for HVAC/R. Expandable Manual Ranging Stick Multimeter for HVAC/R with Temp, NCV, Diode Test and more - model HS33. Based on the success of our original stick meter line, the HS33 was designed to measure even more HVAC/R parameters including temperature with quick compensation via a k-type thermocouple plug, a diode test and a built-in non-contact voltage (NCV) tester. The updated ergonomic shape fits firmly and naturally in your hand while testing. A magnetic hanger, along with the detachable test leads and alligator clip probe tips, allow you to remote test and perform other tests hands-free. This is the stick meter schools prefer for their HVAC/R students. Its got all the basics and more. The rugged rubberized bumpers help this meter stand up to tough conditions in the field. Ranges include VAC, VDC, AAC, ADC, temperature, capacitance (MFD) and a host of other built-in safety features. The HS33 is unique in that its a great starter meter for new field technicians as well as a top performer for veterans who prefer manual ranging digital multimeters meters. All Fieldpiece accessory heads slide on the top, enabling the user to test a wider variety of parameters from a single meter. All this plus the removable tip test leads make safe one-handed testing a snap. As with all electrical testing, please read the Operators Manual and associated safety practices thoroughly before testing and adhere to industry best practices for safety when testing any current carrying device. For DC voltage, set the meter to the VDC parameter instead of VAC (shown below). For all ranges choose a range just above the value you expect. If display reads OL (overload), select a higher range. If display shows less than three numbers, select a lower range for better resolution. Connecting to Fieldpiece Accessory Heads. Connect to Fieldpiece accessory heads by simply attaching them to the top of meter (1) or attach remotely through leads (2). For most heads, move dial to mVDC range shown (1). For the AAC clamp (ACH4), move dial to VAC range (2). Disconnect test leads from voltage before plugging in thermocouple! Insure the temperature being measured is stable. Maintain good contact between the thermocouple and what's being measured. The velcro strip supplied is intended to be used as shown on the right. Tie thermocouple like this and wrap Velcro around surface to make sure bare wires are in close contact with surface being measured. This is especially helpful when taking pipe temps. The k-type thermocouple supplied is designed with a wrap tab to keep the wire out of the way when not needed. Just wrap the wire around tab and pull through the hole at the top to keep in place as shown to the left. No more clutter when stored. The HS meter series is unlike any other found in HVAC/R. We incorporate a number of safety features, both those you can and cant see, into our meters. In addition, the HS series accepts modular test instrument accessory heads. The HS33 is the first evolution of the stick meter concept. While the function of the meter is similar to the orgonal stick meter line, weve updated it since its introduction to include a number of features that make the HVAC/R technicians job easier, better and safer. With the red NCV tab on the tip of the meter close to an AC voltage, press and hold the NCV button. The NCV LED will light with an analog feel and the beeper will beep. The closer you get to AC voltage, the louder the beep. The NCV function is sensitive enough to detect 24VAC on thermostats. The non-contact voltage feature can be used in conjunction with one probe tip to find which wire is live. With meter set to OFF, place probe tip in red plug as shown below. Hold down NCV while touching each wire, a noticeably louder buzz will sound when youve touched a live wire. Using the included amp clamp accessory, model ACH4, on the 200 mVAC range allows you to read 0-400 amps directly on your meter with 0.1 resolution. Use it with the detachable test leads to remote the amp clamp and test with the blower door closed for more accurate readings. For motor-start and motor-run capacitors. Disconnect the capacitor from power first. Short the terminals to discharge the capacitor. Disconnect any resistors that might be between the terminals of the capacitor. High Voltage and Continuity Indicators. In any VAC/VDC range, when you touch a voltage greater than 30V, the beeper will beep and the red Hi-V LED will signal you. The continuity beeper and green LED tell you if the circuit youre testing is open or closed. MIN / MAX and Data HOLD. Press MIN/MAX once to begin recording MIN and MAX. Press MIN/MAX to select current readings MIN or MAX. Hold down for 2 seconds to exit MIN/MAX function. Press HOLD to hold data. Silicone Leads with Detachable Probe Tips. Because the wire insulation is silicone the leads will stay flexible in cold weather and will not melt if bumped by a soldering iron. When testing electrical circuits with two hands, there is a risk that a careless mistake may complete a circuit through your body and potentially cause death or injury. Detachable probes tips and the modular design of the HS33 allow you to plug V lead tip into the top of the meter, connect an alligator lead tip to COM and ground, and perform a one-hand test more easily than most any meter on the market. Rugged ABS case with rubberized bumpers. Built-in magnetic hanger allows you to test with one hand or no-hands. Ergonomic shape fits naturally in your hand. Auto power-off (APO) to conserve battery life. The features and benefits are the competitive advantages when it comes to the HS33. This is truly an HVAC/R multimeter. And, theyre more rugged, convenient, and safe. Loud BEEPERS and bright LEDS to warn of dangerous voltages, even in noisy environments. Automatic HOLD and MAX so eyes stay focused on the test point. Plus modular expandability allows you to take a truckload of test instruments to the job in a bag over your shoulder. Expandable Manual Ranging Stick Multimeter for HVAC/R - HS33. 400A Amp Clamp Accessory - ACH4. Deluxe Silicone Test Leads - ADLS2. Short Alligator Lead Extensions - ASA2. Deluxe Meter Case - ANC1. Patriot-Supply is located approximately 30 minutes from New York City in Plainview, New York. Our vast inventory encompasses all the areas of the HVAC/R market. We sell everything from residential and commercial controls, to draft controls and venting equipment, to hydronic and steam specialties. With seven distribution centers located throughout the US order transit time to our customers is dramatically decreased. And, our integrated order system helps insure that the correct parts get to our customers as fast as possible. Sorry but we do not send "gifts". Our Friendly and knowledgeable sales staff is always here to help you. If you have any questions or concerns don't hesitate to call. You may also be interested in.... The item "Fieldpiece HS33 Expandable Manual Ranging Stick Multimeter HVAC/R Full Featured" is in sale since Friday, September 4, 2015. This item is in the category "Business & Industrial\HVAC\HVAC Tools\Other HVAC Tools". The seller is "patriot-supply" and is located in Plainview, New York.